I have a pretty big intention for us. I want us to fall in love with the planet and ourselves. The funny thing is, is that they're both the same. Somewhere along the way we were told the story that we were separate from basically everything. Separate from one another, separate from the trees, separate from the sky, separate from the flowers, separate from the animals, separate from the seas, and we believed it. We still believe it. When I am at my best, I know that we are one entity, one experience, one ecosystem, one earth. This is not an intellectual exercise, but a true whole body felt sense. But, I have to keep reminding myself, everyday, every week, every month, every year. If I get tired and my attention wanes, I don't see the clues, I don’t hear the proof that tells me that I am so very connected at all times. We live in a world that is so noisy, it takes great focus and great courage to sit in silence and to receive what whispers back. The words that don't make sense at first sound, the ones that ask you to sit and contemplate and reflect their meaning. All through the offering of a few plants, scents and words. May we welcome the mystery, may our hearts break open, may we feel the silence for more than a moment, may we breathe a freshness that is remarkable, may we remember who we are and why we came. Amulette Studios is a plant based, alchemical exploration birthed by Tanya Hughes in 2016. 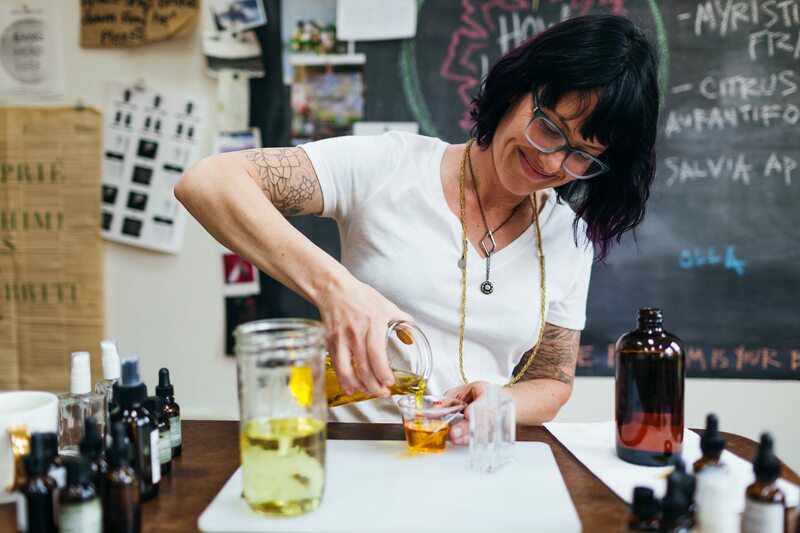 With a 20 year background in massage therapy, multi-media arts, hermetic alchemy and plant studies – Amulette Studios is more of a creative love letter to the soul than a brand or business. Amulette hand crafts small batch anointing and body oils, elementally rich scrubs, magical room sprays and the occasional jewelry artifact all with the intent to assist you in celebrating your Being, awakening your Muse and beholding the Beauty of Oneself and our natural World. AMULETTE is a sacred, personal object that brings protection to the wearer. From your deep complexities, changing moods and seemingly unrelated interests -- You are Life in Motion, You are Consciousness Unfolding, You contain the Moon, Sun and the Stars within your form. Each creation is made by hand and on demand, to ensure your offering contains the most vitality and freshness possible. 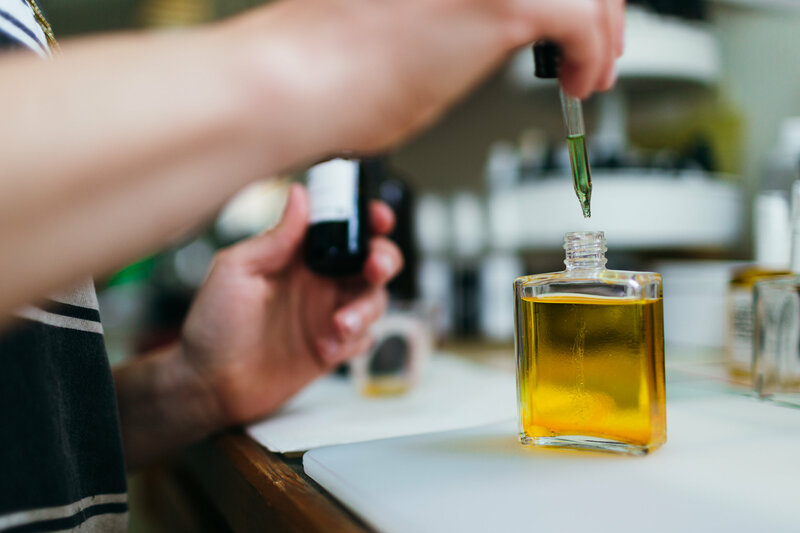 All personal oils, scrubs and sprays have an average of a 1 to 2 year shelf life depending on exposure to direct sunlight and temperature shifts. Products last longer, when stored out of direct sunlight and stored out of extreme hot or cold. All offerings are crafted from pure, unadulterated, raw ingredients, sourced from ethical farmers who provide certified Organic/Fair trade plant ingredients, when possible. Note, that some farmers produce amazing plants and practice Organic farming, but are unable to do the hoop jumping/afford the paperwork expense of becoming "certified" organic. Their plants are no less beneficial than those who have the "certified" organic stamp. Ingredients do NOT contain preservatives, binders, sulfites, petroleum, artificial scents/colors/dyes, chemicals of any kind. I do NOT support animal testing.